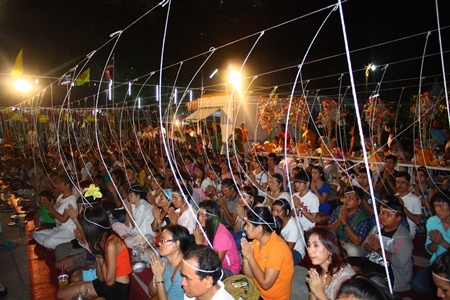 Friday night parties turned to reverence as Pattaya-area Buddhists marked Visakha Bucha Day. 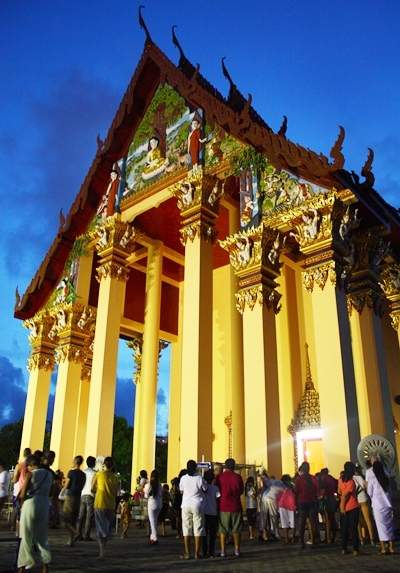 Believers flocked to Nongor, Bhodhisamphan, Naklua, Thamsamakkee, Chaimongkol, and Khao Phra Yai temples to make merit on the triple occasion of the birth of Buddha, the day of his enlightenment and his ascension to Nirvana. Visakha Bucha Day is one of the three holiest days on the Buddhist calendar. Temple-goers dressed in white and lit incense and candles while listening to sermons and presenting essentials to monks to make merit. Buddhists have their wrists wrapped in the auspicious “sai sin” to protect them from evil. 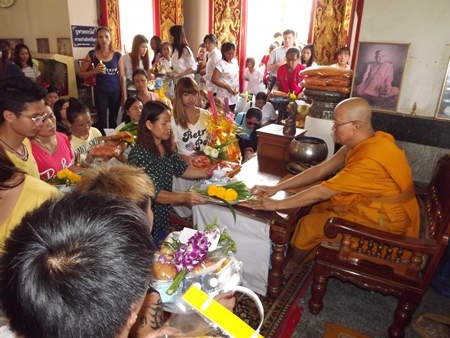 Temples throughout the greater Pattaya region were filled with Buddhists making merit on Visakha Bucha Day – the triple occasion of the birth of Buddha, the day of his enlightenment and his ascension to Nirvana. 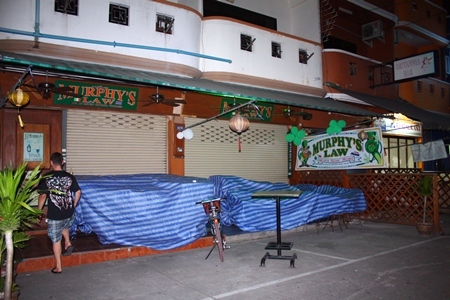 Bars were closed throughout the area, frustrating non-Buddhist tourists and venue owners ready for Friday night fun. Instead, people went to places like Bhodhisamphan Temple in Naklua for the 6 p.m. “Wien Thien” procession ceremony. Thirty students from the Redemptorist School for the Blind attended, making the march despite their limited vision. 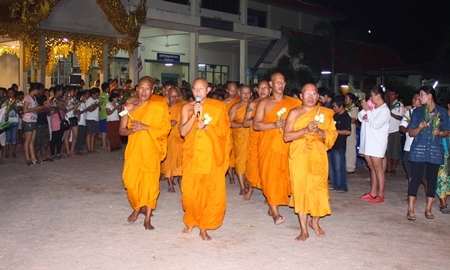 Provost Pravet Thammawaro, abbot of Wat Nongyai, leads the monks and citizens in the Wien Thien around Phra Phuttha Leela located in the middle of the temple grounds. At Nongor Temple, monks led worshippers in prayer. Afterward, the abbot led 200 people in a Wien Thien procession around a large statue of the Lord Buddha. Buddhists present Sanghathan and other items to monks at Wat Chaiyamongkol. With its downtown location, Chaimongkol Temple attracted the largest crowds with parents, children and grandchildren tying string bracelets for prosperity and applying gold leaf to a new Buddha statue. Pattaya Ladies Development Group President Naowalak Khakhay presided over the ceremony, which was also attended by Mayor Itthiphol Kunplome and MP Poramet Ngampichet. Once complete, the Buddha will stand 2.1 meters tall, posing at an angle with a sword-like weapon in one hand and a money bag in the other. 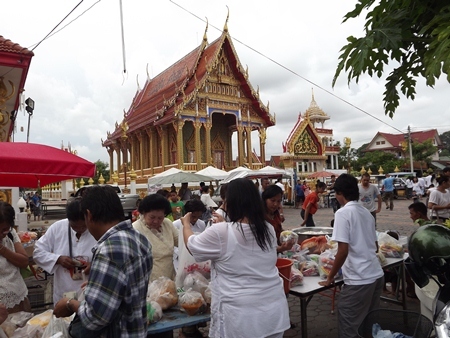 At Wat Nongyai, citizens purchase food to present as alms. 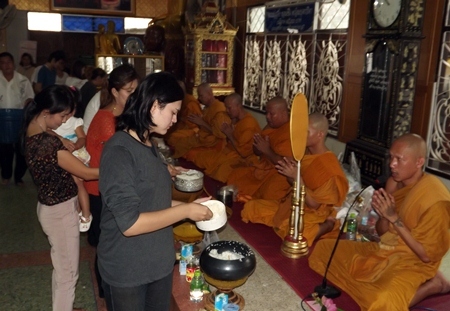 Faithful Buddhists offer alms and make merit on Visakha Bucha Day at Wat Nongyai. 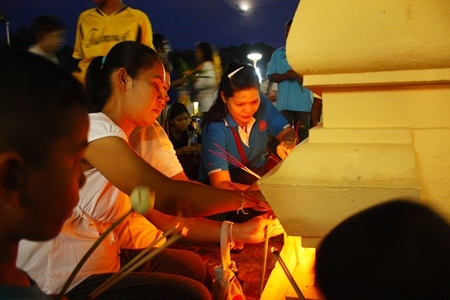 Citizens light candles and incense before the Wien Thien ceremony around the Bhodhisamphan temple hall. Folks attend the casting of Lord Buddha’s statue, the head being cast in gold, at Wat Chaiyamongkol. Children from the Redemptorist School for the Blind chant their flowers presentation words before the Wien Thien ceremony. 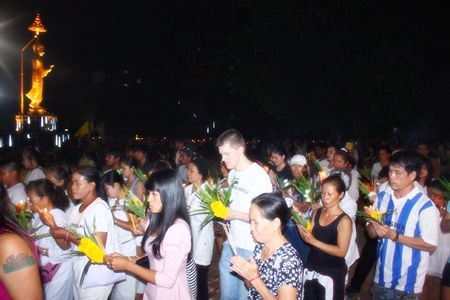 Pattaya citizens and guests perform the Wien Thien ceremony at Wat Nongor. Followers perform the Wien Thien ceremony around the Wat Bhodhisamphan temple hall. Bars throughout the Kingdom readily close their services on this important day for Buddhism.